The profile of Rambler 88 is very original, featuring distinctive vertical topsides, a bezeled tumblehome on the upper topsides extending from the bowsprit all the way to the transom, and a pronounced rake in the mast and in the keel fin. One might ask the relationship between an ultralight maxiyacht and a whale? Juan Kouyoumdjian did not fear to create a paradox here, and he often enjoys astonishing his clients. It turns out that the pectoral fins of marine mammals never stall. And there is nothing worse than having an unresponsive helm on a maxi yacht sailing at full speed amongst a crowd of other boats gathered at a start line or when close reaching on the crest of a wave. So Kouyoumdjian was inspired by the renowned properties of the humpback whale fins to design the rudders for his latest yacht, Rambler 88. First, let us address the size of this 88ft boat, why not 100ft like the other supermaxis? Rambler 88's owner George David wanted to win races on a boat with a 6 metre draught. Kouyoumdjian could have designed a 100 footer, but to be competitive, he would have needed an extra metre in draught. So the project was settled at 88 feet. Launched on December 10th of last year at the New England Boatworks in Portsmouth, RI, the new Rambler was designed, like her older namesakes, to break ocean records and win offshore races. 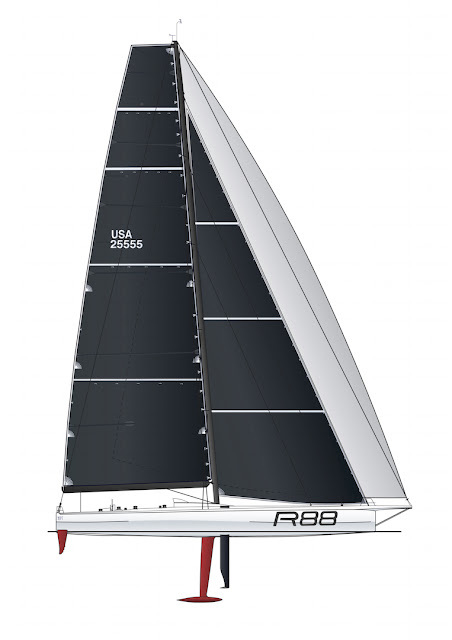 Built in full carbonfiber, this "small" speed machine features the same characteristics than her latest competitors, like Comanche (VPLP and Guillaume Verdier design), which was launched three months earlier. Her forward stations, with a full bow and a hard chine reminiscent of the vaka (centre hulls) of ocean trimarans, are very sleek, probably more so than previous maxiyachts. This hard chine configuration also features a distinctive topside step to flare off sprays efficiently, instead of flooding the cockpit as in the Volvo Ocean 65s. This hard chine has the benefit of providing good buoyancy in the upper topsides, despite a narrow waterline. Rambler 88 implements this feature even further than Comanche, and as such is indeed a genuine development of Groupama 4, the winner of the previous Volvo Ocean Race. After the bow, the bilge is flat so as to favour planing, and rounds gradually. The sheer plan emphasises the importance of the forward part of the hard chine which flares off sprays, as well as its sinuous shape. The waterlines in the half-breadth plan are practically rectilinear and very sleek. As in Comanche, the rear half is a skimming dish. As in previous instances, Kouyoumdjian payed special attention to the keel area, which is positioned in a distinct concavity; This extends the reach of the bulb when the keel is fully canted. As in previous IMOCA Open 60s for the Vendée Globe, the rotation axis of the keel has a positive slope, around 3°, in order to generate a slight vertical lift when fully canted. 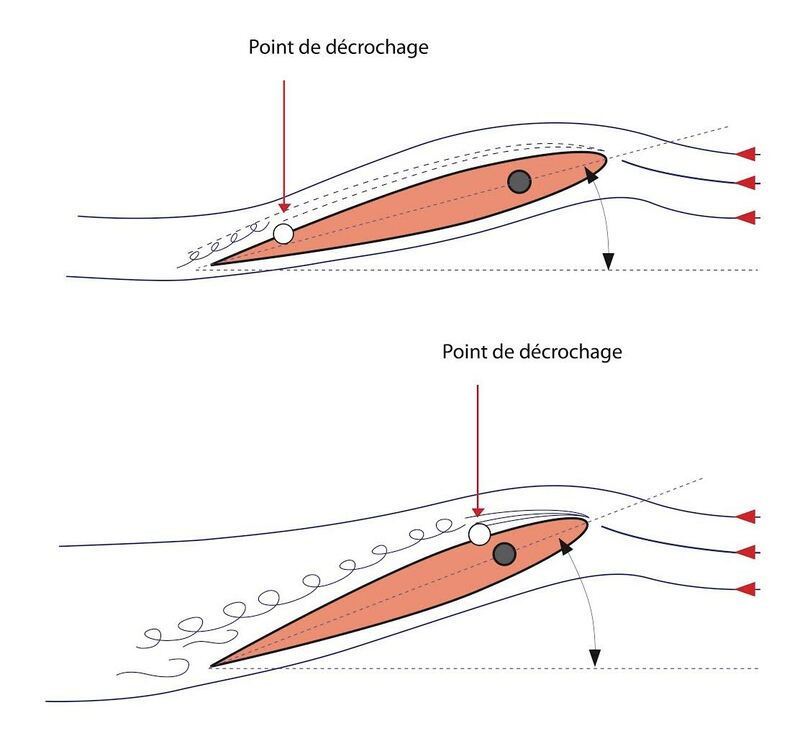 Kouyoumdjian's team focused especially on the heeling behaviour to draw the lines of the boat: the hard chine is not straight, instead the central part is a slightly raised soft chine, in order to increase the lateral wetted area, all the while minimising waterline dissymmetry in heeling conditions. 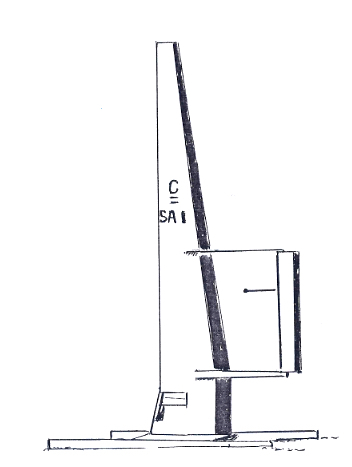 The keel rotation axis was raised by 20cm into a hull concavity and the keelfin was lengthened in the same amount. 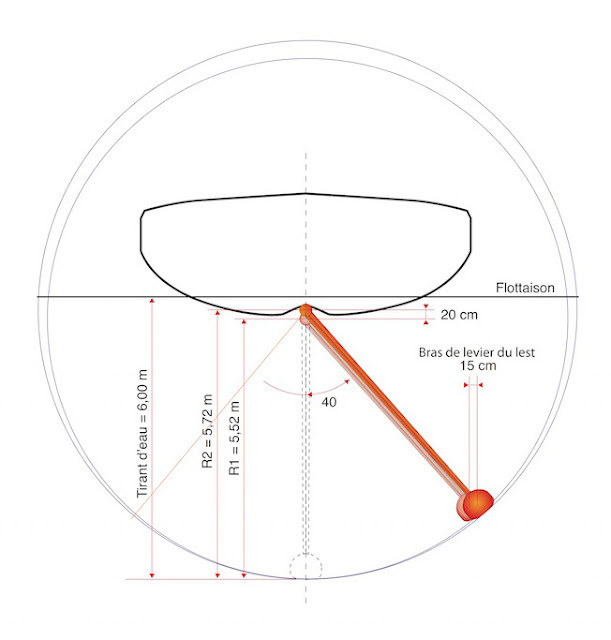 When the keel is canted 40°, the righting lever of the bulb benefits from an extra 15cm offset. The daggerboards are of the same type as those of Comanche and of certain Volvo Open 70s. They have narrow terminations and a small bulb, reducing tip vortices and turbulent flowlines. They feature a slight inward slope and are kept out of line of the rudders. Kouyoumdjian's team is highly specialised in sophisticated appendage design and surprised onlookers by producing shell-like rudders for Rambler 88. They were inspired by the pectoral fins of humpback whales to try to solve several problems which did not seem to have clear links between them. These huge flat-bottomed speed machines cannot be raced by autopilots, instead they require a unique racing approach, similar to that found in the Monte Carlo rally: In order to navigate faster between waves, the helm is often jolted violently, separating waterflow at the rudders, sometimes momentarily stalling them and disabling steerage. Also, twin rudders are capital on wide bodies, but the windward rudder often drags in the water at an unfavourable angle. Studies of the humpback whale's renowned tubercular fins are not new, and those of Dr. Frank E. Fish, published in 1995, are authoritative. There have also been a few instances of rudders with protrusions mimicking the humpback's tubercles. According to Kevin Welch, the second owner of the Icon 65 designed by Bob Perry and launched in 2001, the helm had a tendency to stall when the boat was driven hard. This 20m (66ft) boat was designed with a removable interior for racing, as well as a dropkeel for shoal cruising. When Perry called upon performance specialist Paul Bieker to think about changing appendages, the latter picked up a 2008 paper published by the University of Harvard titled "How Bumps on Whale Flippers Delay Stall: An Aerodynamic Model". 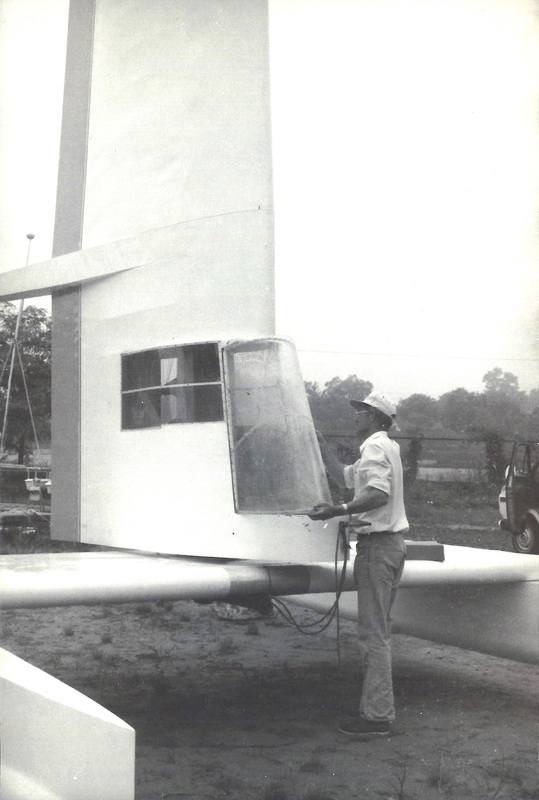 Written by Ernest van Nierop, Silas Alben and Michael Brenner, this paper was based on the results of wind tunnel tests as well as theoretical computations which proved that greater protrusions on the leading edge of a foil could delay stalling. Bieker designed a rudder with three of these tubercles in the upper section and Welch was delighted to note that the change had stopped the boat from stalling. It turned out that the pectoral fin was in fact an excellent "hydrodynamic model". 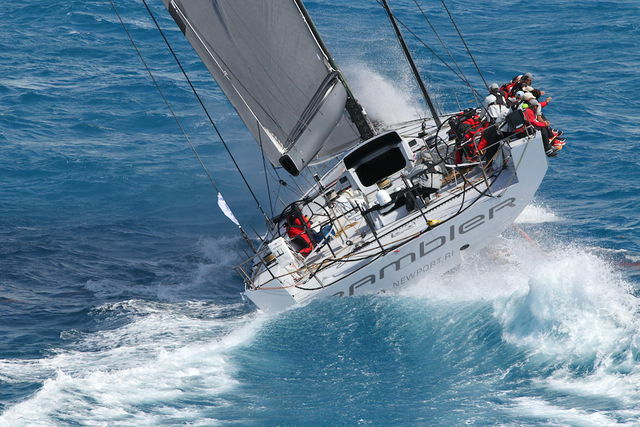 Rambler 88's first outing took place during the Ft. Lauderdale to Key West Race last January. Sailing her first race in spinnaker weather with no sizeable competitors, she easily achieved line honours, completing the 160 nautical mile course with a small genoa in 11 hours 51 minutes with a 13.5kt average. She missed the first place on corrected time by a hair (5 thousandths of a knot), beaten by the Shaun Carkeek C40 Spookie, which arrived over four hours behind her. In the following month, George David's new maxi took the start line of the RORC Caribbean 600 race, held around the Leeward Islands. Rambler 88 took line honours in 1 day 19 hours and 5 minutes, breaking the standing monohull record held since 2011 by her namesake Rambler 100 by four hours. This time she raced with her complete set of sails, including a large bowsprit genoat and all spinnakers, which increased her IRC/TCC rating significantly. She took third place on corrected time, behind the mini maxi Bella Mente and the TP52 Scorcha. The most exciting rendez-vous took place in the following month in the idyllic setting of the Voiles de Saint Barth, with race courses decided on the morning of each race to suit the weather forecast. 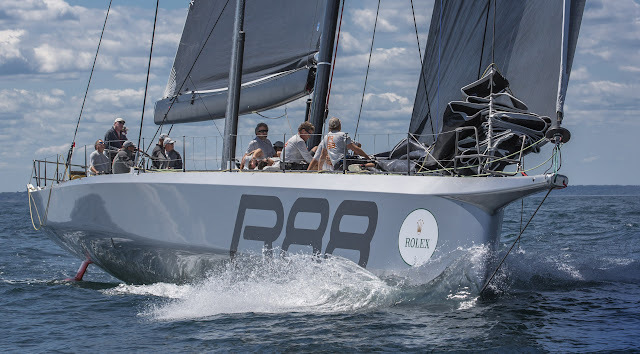 The thrills came from Rambler 88's match with the 100ft scarecrow Comanche, owned by Jim Clark, designed by VPLP and Guillaume Verdier, and skippered by Ken Read. Though Comanche's extra 12ft provided higher speeds in all conditions, Juan Kouyoumdjian gave right to owner George David and skipper Brad Butterworth, who beat Comancheon corrected time on every occasion. George David said: "Of course, she was ahead of us on elapsed time and I admit that I was impressed by her speed". Richard Mille rewarded every crewmember of Rambler 88 with an RM 60-01 Regatta Flyback Chronograph timepiece, one of the most expensive production watches at the moment, estimated to retail at the same cost as a 40ft sailing boat...This wristwatch, with a battery life of a mere 55 hours does have the advantage of having a compass which point to North correctly in both hemispheres. Kouyoumdjian has succeeded in delivering a faster boat than the 8-year old Rambler 100 in any condition. He has not spared compliments to the designers of Comanche who have "significantly raised the bar in the sailing game", and has returned to the drawingboard of an upcoming 100-footer project with 7m draught! Of all marine mammals, the humpack whale has always astonished onlookers with its jumping prowess. 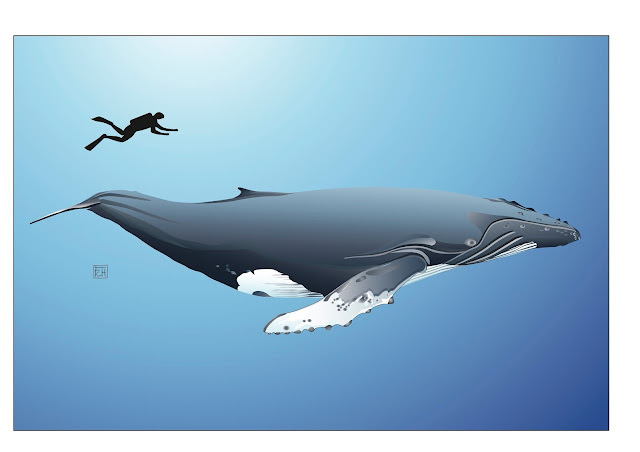 Despite weighing as much as 30 metric tonnes, these capable swimmers can achieve a maximum speed of 15kt, turn on the spot, breach completely, and spin on themselves. Black in colour, with distinct white spots, every individual can be easily identified. The shape and colour of their pectoral fins are also unique identifiers. The fins themselves have been the subject of multiple biological studies, including that of Dr. Frank E. Fish and Juliann M. Battle, from the West Chester University of Pennsylvania, published in 1995, which remains the reference work. The detailed descriptions of the fins of a young 9-metre individual and the following hydrodynamic analyses published by aeronautical researchers have proven the exceptional qualities of this appendage, particular skilled in carrying out incredible moves for such a massive animal. fishing technique: surfaced, mouth wide open or creating bubbles to resemble a school of fish, solitary or in groups. If we section the fin from top to bottom, as Dr. Fish did, the shapes appear evidently irregular; None are the same. The curves on the leading edge vary randomly. 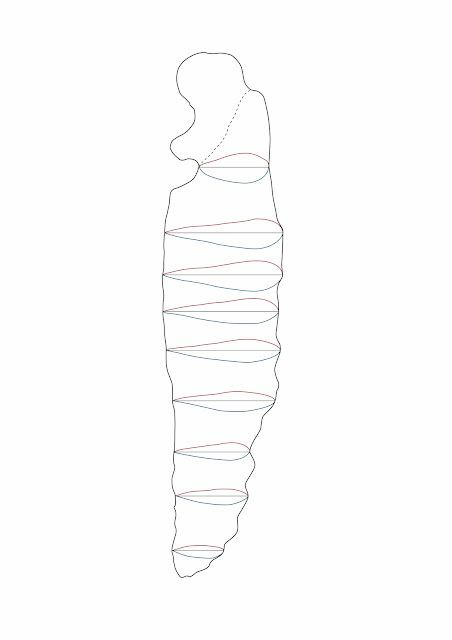 However, it is possible to isolate these curves and to categorise them into a profile class. In turn, we can observe that a this section corresponds to a NACA 634-24 foil profile, as described in the reference work by Mssrs. 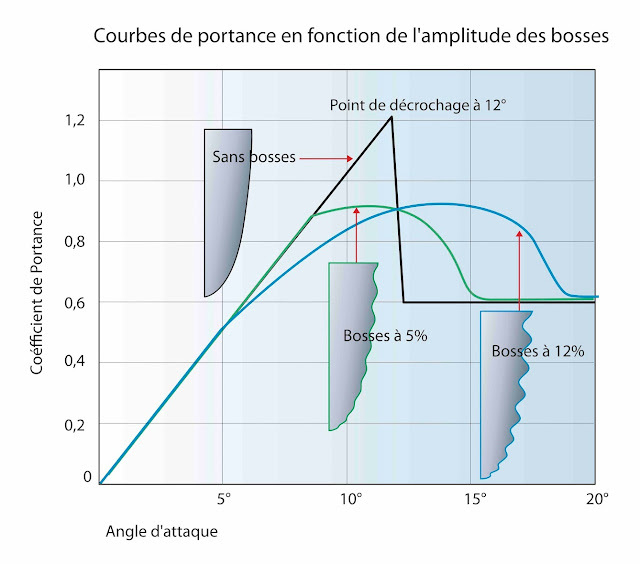 Abbott & Dœnhoff, and that its curve provides the best lift coefficient for angles of attack in excess of 15°, whereas conventional rudder foils stall when the angle of attack exceeds 12° (The National Advisory Committee for Aeronautics, NACA, was established in 1915, and carried out exhaustive classification of hydrodynamic and aerodynamic foil profiles in the 1930s, before being dissolved and transferred into NASA). By sectioning the external and internal surfaces of the fin studied by Dr. Fish, much as in a half-hull, we can observe that the lines are far from smooth or symmetrical in shape. The lower surface features a slight convex area on the after section. 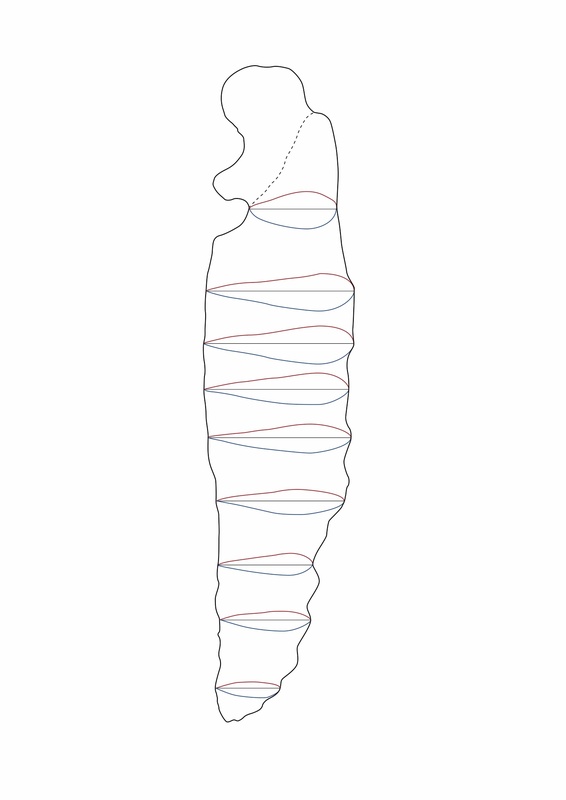 In fact, this appendage appears so misshapen that it breaks established laws of hydrodynamics. It would seem that this complexity is essential to achieve greater efficiency! Up to an angle of attack of 10°, the boundary layer is in steady flow, but the separation point moves gradually toward the leading edge. At approximately 12°, depending on speed, medium viscosity and surface state, the boundary layer separates at the leading edge, lift drops dramatically and the foil stalls. Measured at a given depth on a rudder with high angle of attack, the flowlines generate eddies on a conventional foil shape, but they remain linear and generate more lift on a foil that features protrusions. The greater the protrusions, the later stalling is delayed. The conventional smooth foil stalls at 12°, whilst the foils that feature protrusions retain a normal curve without a threshhold limit. In 2001, Dr. Fish's University published a remarkable paper that he wrote in cooperation with Dr. Philip Watts, founder of Applied Fluids Engineering, Inc. 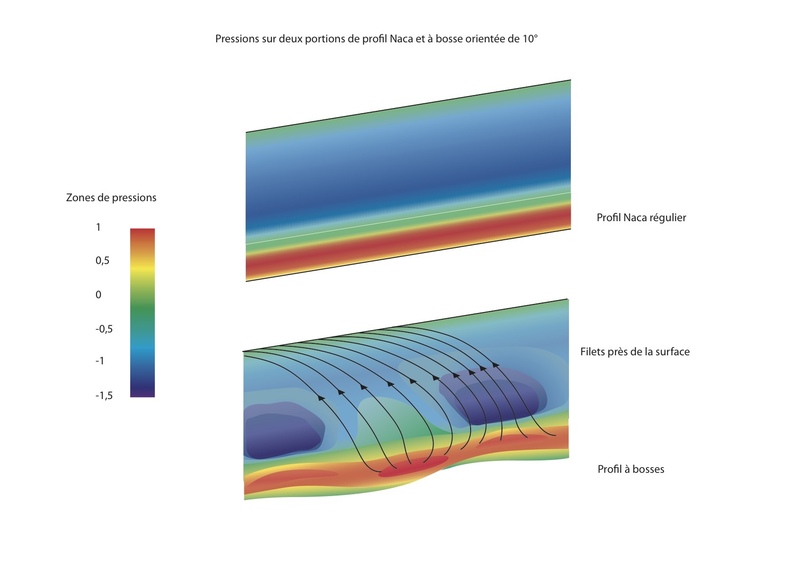 The work included measurements of the tubercle effect on the leading edge of an airfoil with a 10° angle of attack. The work noted that the addition of protrusions provided a 4.8% increase of the lift coefficient and a drag reduction of 10.9%. The paper submits that flow deflection increases laminar flow and delays stalling. Having completed 90 drawings for the book on the History of the Little America's Cup, I lay puzzled when someone asked me which C-class I preferred. Finally, I settled in Dulcinae, largely unknown, although she sums up the spirit of this race well. 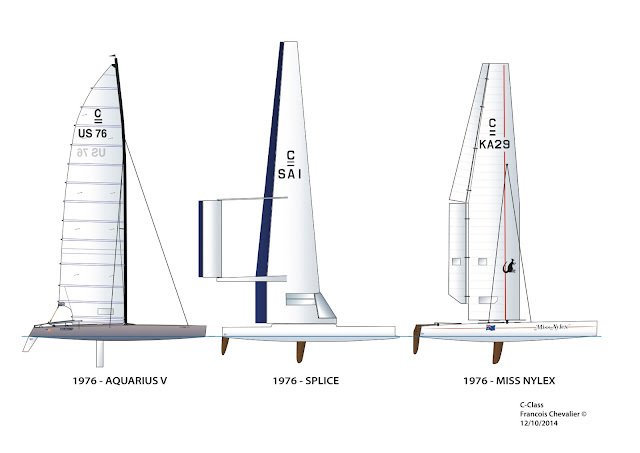 The Little America's Cup has a fascinating history of international challengers competing in the World's fastest catamarans, all measuring 25 ft in length, 14ft in beam and with a 300 sq ft sailplan. Since 1961 this race has given rise of the wildest of ideas, with the development wingsails tried in the first decade and many other astonishing innovations, which shall be discussed before the launch of the book. 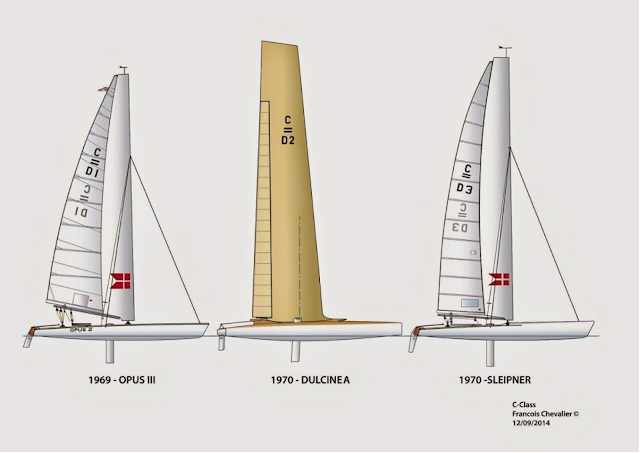 Dulcinea was designed in 1970 for 4-time gold medal olympian Paul Elvstrøm, by Ib Pors Nielsen, an engineer who had previously managed the Danish team in the Little America's Cup. Leif Wagner Schmidt and Hans Gert Frederiksen, the designers of the challenger Opus III, had won over the defender Ocelot, putting an end to eight years of British dominance in the event. Paul Elvstrøm had attended the event at the Thorpe Bay Yacht Club to support his fellow countrymen and had been won over by the atmosphere, the technology and the speed of the C-class. 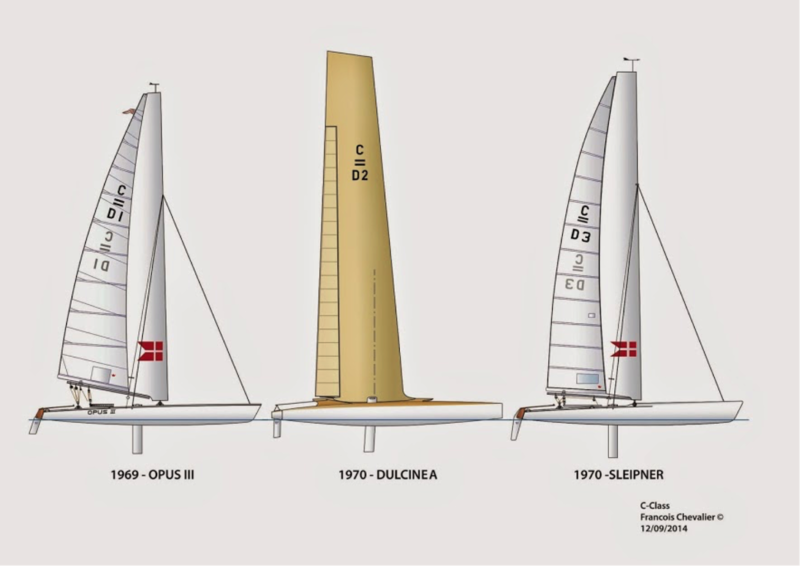 In 1969 the Danes only had one C-class, so it was impossible train in match racing. They had two boats but only one rig: Opus III had inherited it from Opus II. Their victory was due in large part to an ageing defender, Ocelot. Thus Elvstrøm and Nielsen's project was a good opportunity to defend the Little America's Cup in Denmark. Schmidt and Frederiksen were satisfied with the lines of Opus III, of which they raise the bow, and for which they develop a wingmast with a larger sail area. On his part, Nielsen is decided on producing a revolutionary catamaran, featuring a wing with high aspect ratio, extending to a cylindrical base, and capable of rotating 360°. He completely removes sails, providing the wing with a trailing edge flap wide enough to offer substantial trimming possibilities and remain efficient downwind. 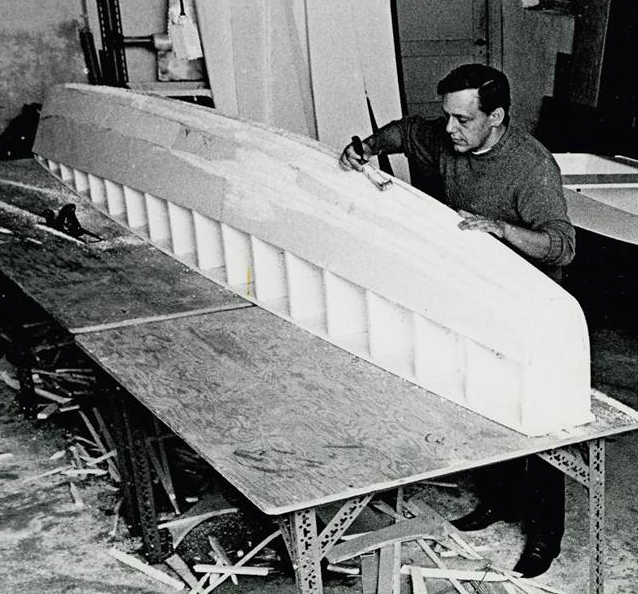 Ib Pors Nielsen, who passed away in 2012, designed many trimarans after Dulcinea, though all more conventional in type. 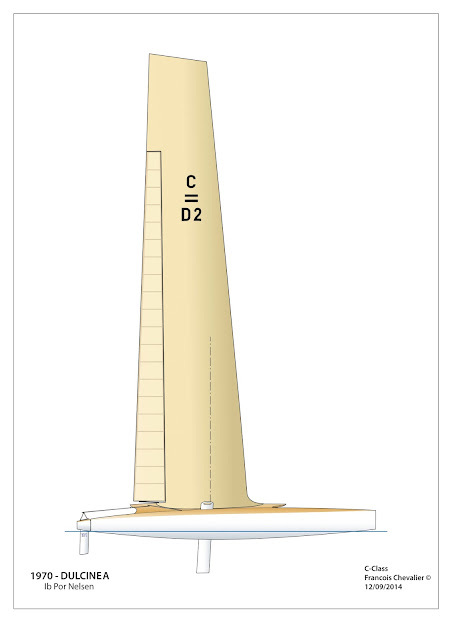 Dulcinea's deck layout clearly shows the integrated circular wing base. 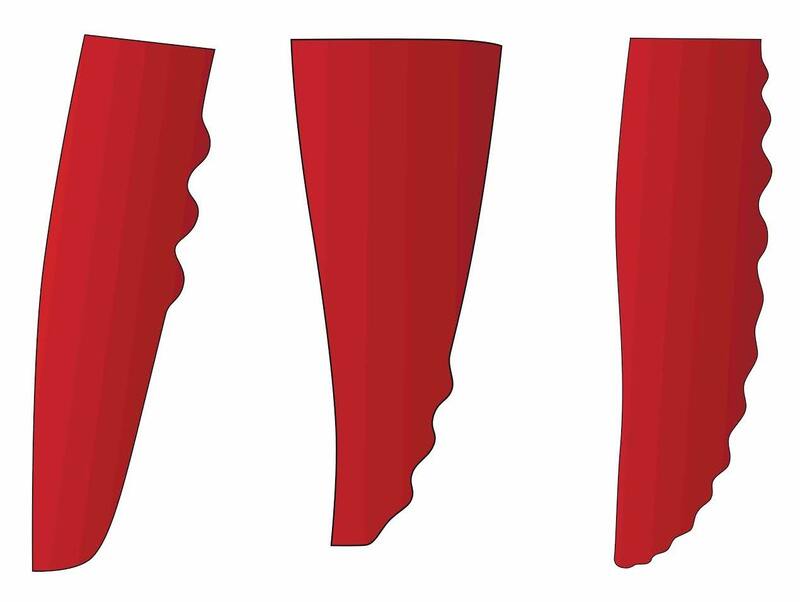 The mast sections are NACA 682-615 profiles, with a 16% thickness/chord ratio at the base. A puzzled Elvstrøm contemplates the assembly. 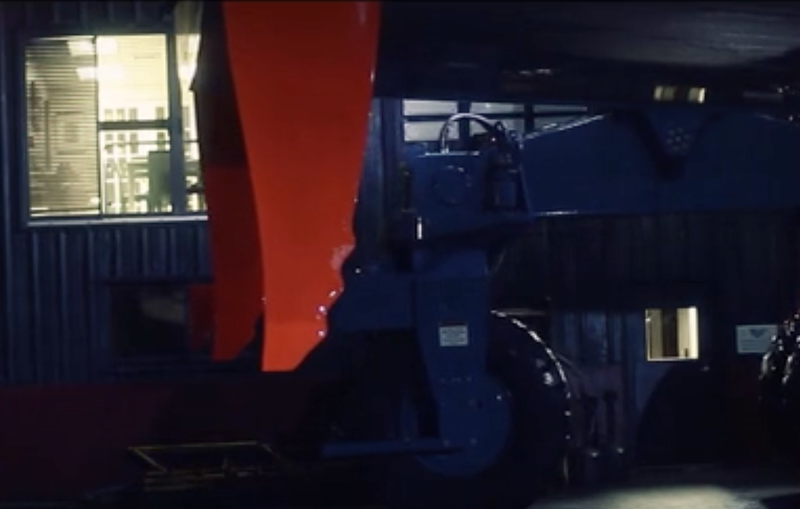 With Dulcinea on her side, Elvstrøm holds one of the gym ball bearings in his left hand. A timid outing aboard Dulcinea, the deck is not ideal for hiking, the nicks in the hulls to rest one's feet are not reassuring, especially as the boat is not fitted with stays or even a trapeze. Dulcinea, between the successful 1969 challenger and the unsuccessful 1970 defender. Dulcinea became the first European C-class catamaran to feature a wingsail when she was launched, shortly before Schmidt and Frederiksen's Sleipner. She bore sail number D2. The turnplate base, integrated in the deck, measured 2.70m in diameter and revolved on a peculiar ball bearing arrangement: 50 gym balls in a track to dampen the loads! 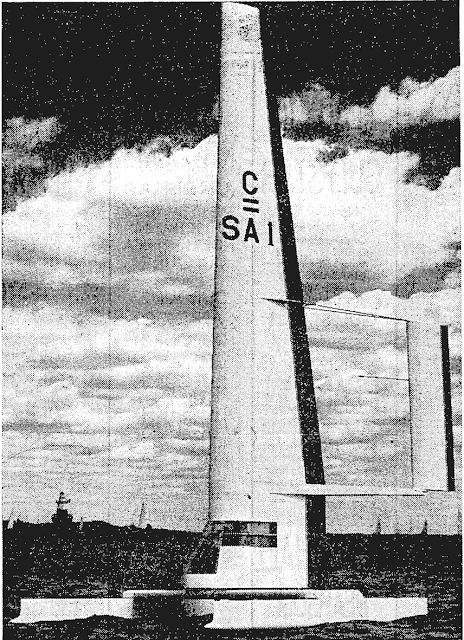 The wing was a self-standing NACA 682-615 airfoil measuring 12m and weighing 70kg. 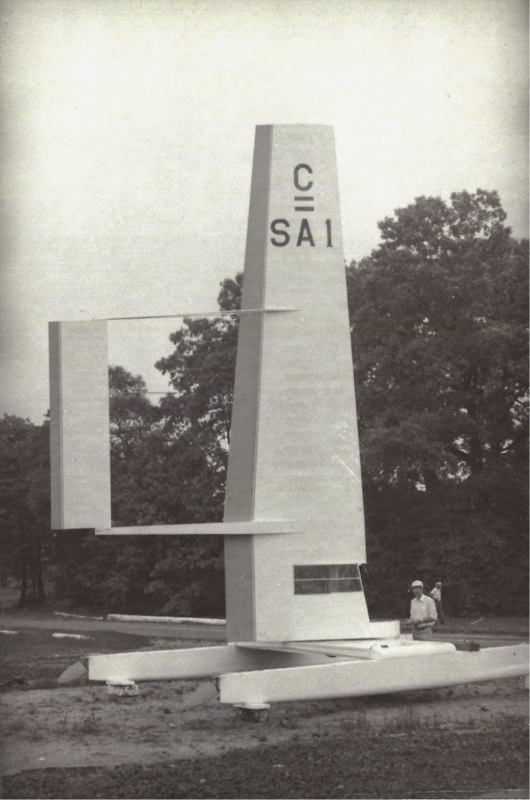 The frame build was moulded wood, aeronautical plywood as well as expanded polystyrene of 15kg/m³ for the sections. During Dulcinea's first outing, Elvstrøm was surprised by the wing's power, and a trapeze, deemed unnecessary due to the wing's ability to turn about completely, was found lacking: the catamaran heeled, then accelerated, broached, finally capsizing and breaking the wing. Repairs took a few days, too long for Dulcinea compete against her fellow contender Sleipner, although she did manage astonish the journalists aboard a powerboat as she overtook them. Splice was the only South African C-class catamaran, but what a C-class she was! She made all heads turn when she arrived on the Eastern seaboard for the 1976 Little America's Cup selection trials. I would not know which unique attribute to describe first. 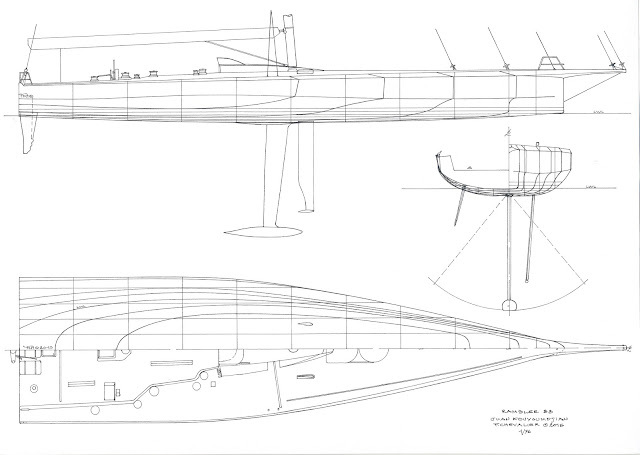 To start with, she complies with the C-class, being 25ft in length, 14ft in breadth and with sail area capped at 300 sq ft. 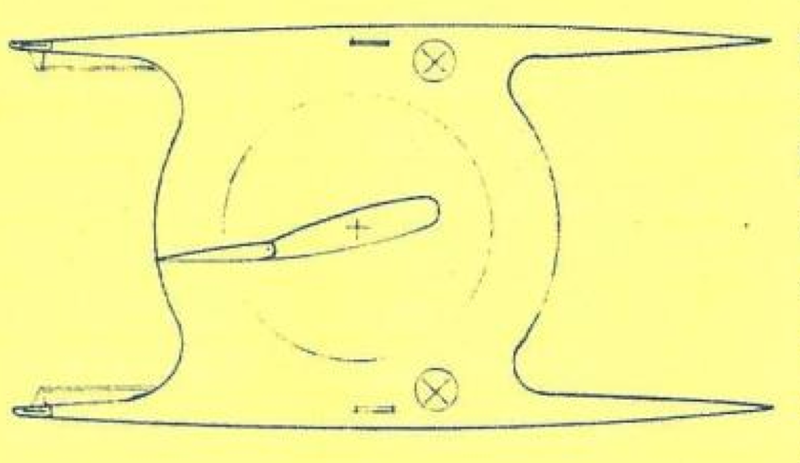 However, in principal and by definition, there would be a crew of two, but Splice's cockpit, below the wing, only has space for one. And because the wing takes the entire width of the forward crossbeam, the other crewmember is hard pressed to change sides. 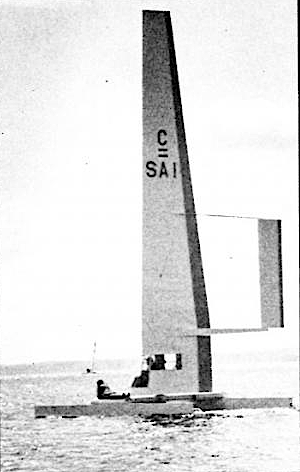 The wingsail had one trailing edge flap that spans the entire height, with a stabilizing aftercanard, which itself features a trailing edge flap. This configuration vaguely resembled a vane steering system developed in Seattle, WA. The two hulls was linked by a single large crossbeam, although the wing base was wider still. 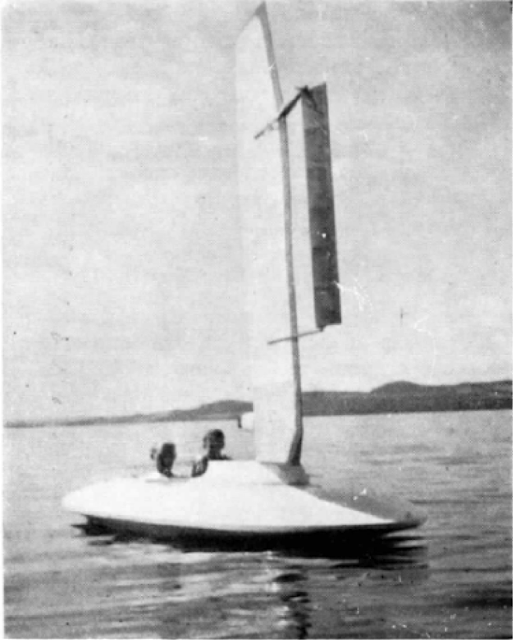 During the Second World War, Norwegian Fin Utne built Flaunder, a winged sailboat that featured a self-steering aftercanard. 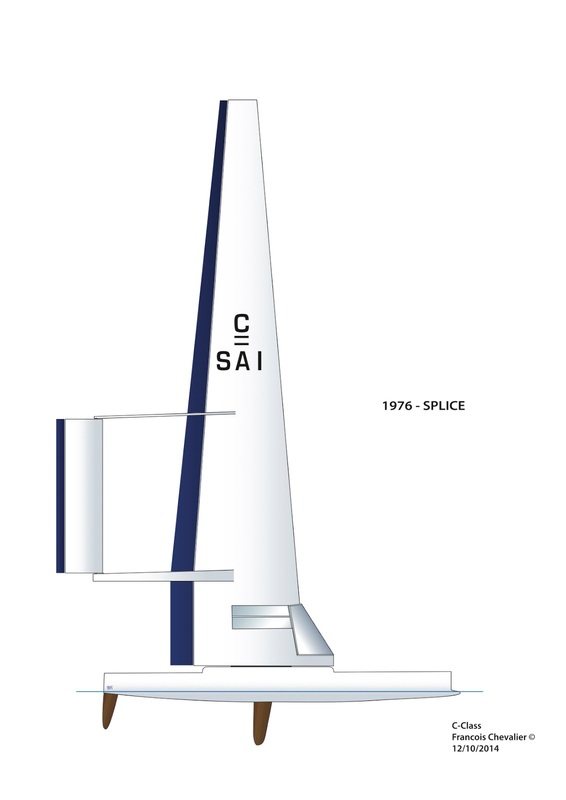 The Amateur Yacht Research Society had produced this sketch of Splice in March 1976, indicating that a Russian researcher had proposed a similar closed cockpit on a land yacht in 1940. 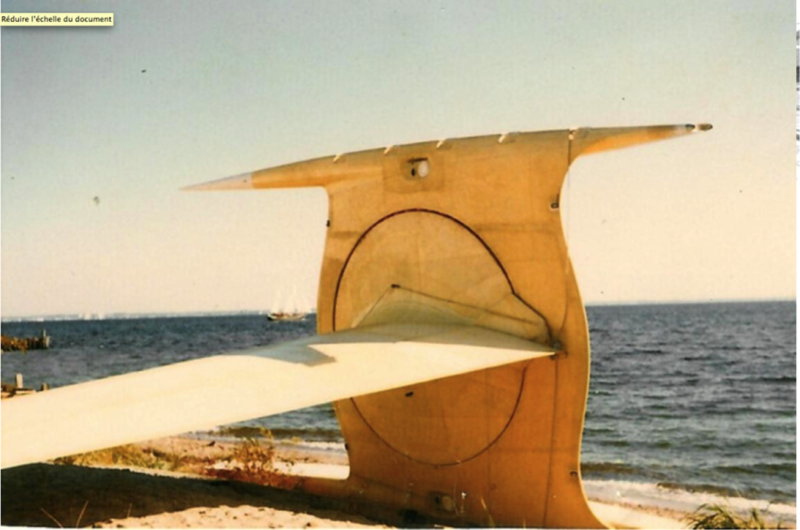 The wingsail had a particularly high aspect ratio, and turned 360° on a hard wooden base disk. There was no trapeze, no stays, and the helmsman remained enclosed in his plexiglass cockpit at all times. The aftercanard and its flap were controlled from the cockpit, and determined the incidence of the wing and its flap. The rudders were pedal-controlled. The pilot, whilst in the cockpit generated no air drag, but could not get out, and thus could not hike. There was a single centerboard located beneath the wingsail which swung laterally into place! The hulls hulls had very low freeboard, the bows were equipped with bulbs, similarly to large displacement vessels. The protrusion extended almost to the crossbeam. The rudders could retract into slots in the double-ender sterns. Splice's designer and builder, South African 54 year-old Patrick Beatty, from Bedfordview, a suburb of Johannesburg, was a glider pilot, engineer and builder. He spent three years to develop this C-class, testing her in a lake close to Johannesburg before shipping her to Rowayton, CT. 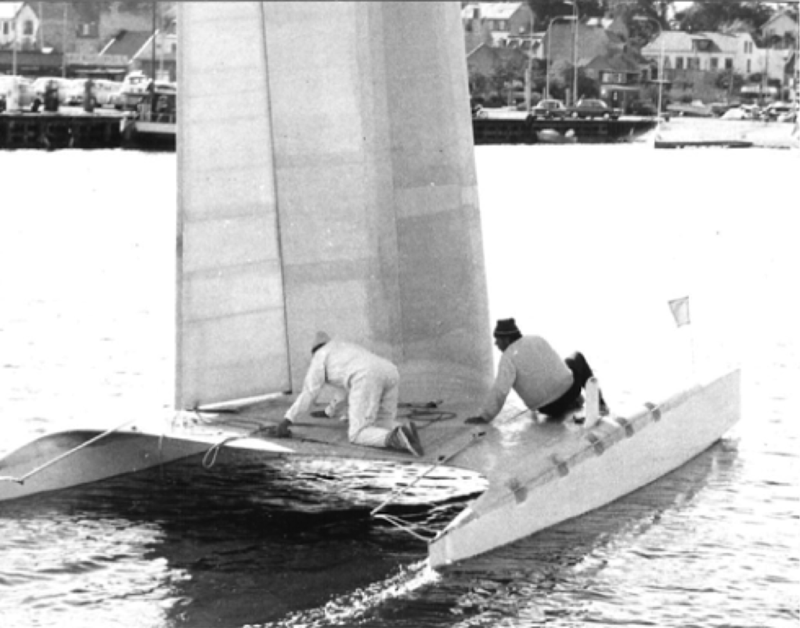 In September 1975, the Roton Point Sailing Association was bustling with activity, with three weeks of competition: the NAMSA championship, the Pacific and Atlantic championship, followed by the selection trials for the Little America's Cup, to be held in Australia in February, against Miss Nylex. 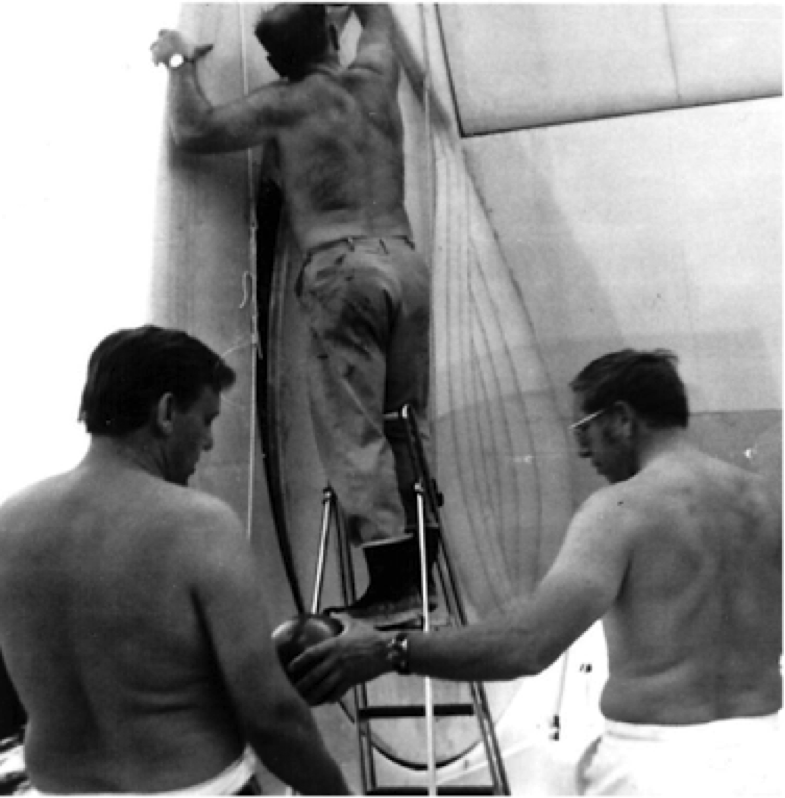 For Splice's first outing, Beatty wanted to sail singlehandedly, but the sailing committee retorted that the C-class rules requires a crew of two, so a young volunteer was designed to sail with him. Considering the dangers that he would encounter in tacks, as well as the risks of impaling onto the centerboard lever, Beatty was eventually authorised to sail alone. in lower left hand side. 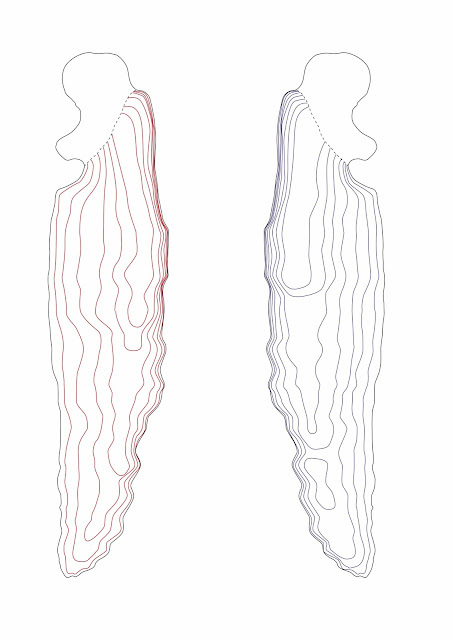 Splice immediately displayed formidable upwind performance, with exceptional heading. However, on the reaching tacks, her lateral stability showed weakness, with her leeward hull sinking distinctly. On the running tacks, the wingsail gave a lacklustre performance, her flaps being to small to generate much lift. Her only hope in getting to the mark was to beat downwind on a series of broad reaches and gybes. The New York Times used this photography of Splice to relate the Little America's Cup at the Roton Point Sailing Association, in Rowayton, Long Island. During Splice's first outing, the extra crew was lying on the deck et Beatty was at the cockpit controls, just like on his gliders. That first day of racing was the last. A violent storm damaged Splice overnight, and repairs could not be carried out to make the selection trials. Beatty truncated the wingsail and donated it to Professor Sam Bradfield of Stonybrook University. Bradfield, a hydrofoil pioneer, kept Splice a short while as Beatty returned to his home country, never sailing in the C-class again. He and his wife died in a car accident in 1991. After the storm, Beatty decided to lighten and truncate Splice's wingsail, and put her up for sale before returning to South Africa. Californian Alex Kozloff won the American challenger selection trials aboard Aquarius V, even though Patient Lady III had dominated the championships, but her wingsail was broken in the last week of racing. In February 1976, Alex Kozloff successfully defended the American flag against Miss Nylex, winner of the previous edition. Alex Kozloff, aerodynamicist, is a light catamaran expert. He was convinced that, in light airs, Aquarius V's soft sails could beat a wingsail if the overall weight of the boat was light enough. The 1976 Little America's Cup proved him right and the Australian Miss Nylex was beaten 4 races to 3. The "Little America's Cup" has been forbidden from serving as an official name, after having been affectionately known as such ever since its inception in 1961. Over the years, it has been known as the International Catamaran Challenge Trophy and the International C-Class Catamaran Championships. It will be raced again in September 2015.